The Linuxstamp is designed to be a general purpose processor module. It is designed to work as a stand alone module (micro-SD card, Ethernet and USB/Serial converter are all on the module). This allows all initial development to be done without a motherboard, but for integration into a specific project a motherboard with specific features could be designed. You can now purchase Linuxstamp II boards from thelinuxstamp.com. Some of the original Linuxstamp info is still useful. It is very easy to make a motherboard for the Linuxstamp II such as the 8-channel RC Control board. The current Linux distribution is Emdebian. It is located in the NAND flash and uses UBI & UBIFS. The Emdebian folks have done a stellar job on Emdebian, and the best part is if the package you're after hasn't been "gripped" yet you can get the normal debian version. # the order of sections is not important. # is used to calculate the list of Priority: required packages. To use a different directory, use the -d option to multistrap. Next we'll need a working etc/resolv.conf file. You can copy this from any working linux box on the same network. Now we should have a working network. Now we can chroot into this new root fs from a running unit. I use a rootnfs setup that the ls2 is already booted into for this step. This does of course present a chicken & egg problem of how do you get a working emdebian root fs to bootup in order to run the chroot command. The simple answer is to use an existing emdebian root fs. Another option is to massage the root fs just created. The main requirements for this are adding the device nodes (same ones we add from chroot environment) & /etc/inittab (this is created from dpkg --configure -a within the chroot environment so it would need to be created or copied in). And finally there has been some talk of using qemu from an x86_64 side for this in system configuration. Now that we're in the chroot environment we can do some more configuration. First well need some device nodes before udev comes up. This could also be done with multistrap. And comment all the ttyX lines. Now back to dpkg --configure. dash needs a little extra work to configure. To get dash to configure first /var/lib/dpkg/info/dash.preinst will need to run correctly, to do this some man dir/files need to be created/touched. 'apt-get update' is now very happy, and you can 'apt-get install' until your hearts content. you can use crosstool-ng to generate a cross compiler. The documentation on the website is very good. Emdebian also has pre-built cross-compilers that you can install, as well as the tools to build your own. First we need u-boot. If you have not yet built a cross compilier now would be a good time to do so (See the cross compilier section above). Now you can do a test for the Atmel at91sam9g20 EL board using NAND. The power supply for the board is based on the Linear LTC3407-3. This is a very compact high frequency switching power supply. It has both a 3.3v and a 1.8v output. It does have a very tight input range 3.3v-5.5v. The Micrel PHY also needs 2.5v, but this is provided by an internal regulator. Currently a regulated 5v must be used to power the board. Above shows the proper connection of the ftdi cable to the Linuxstamp II. This provides both the debug console as well as power to the board. Pin 6 (green wire) on the cable overhangs the 5-pin connector on the board. When you plug the Linuxstamp into your host (Linux) machine a device should appear /dev/ttyUSB0 (the suffix number will increment as you add more devices). /dev/ttyUSB0 will behave as any other serial port now. Minicom is the standard program to access the serial port in Linux. The first time you run minicom you will have to be root in order to do the setup, after that you can change the permissions on /dev/ttyUSB0 so any user can run minicom. To enter configuration mode in minicom type CTRL-A o, now scroll down to Serial port setup. Use the letters to navigate. You will want the device to be /dev/ttyUSB0 and Bps/Par/Bits to read 115200 8N1. Both hardware and software flow control should be OFF. 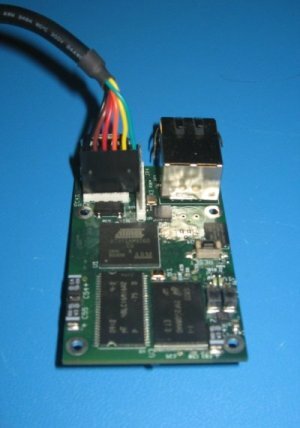 Connection to the board is important for loading Atmel's tiny program and u-boot, but once the board is working it might not be as important. Nfs (network file system) and tftp (trivial file transfer protocol) are two servers you will want running on your host machine. Nfs is useful for hosting the root file system of the Linuxstamp. Tftp is useful for u-boot to retrieve the kernel from. There are many other websites on nfs and tftp, but I will try and go over a simple setup. I would suggest being behind a firewall before trying either of these setups as neither is secure. I wrote this using a Fedora 7 system. You may have to modify the iptables on the server to allow a client to connect to the server. <path_to_nfs_root> = This is the path to the root file system on the NFS machine. <server_name> = This is either the server host name, or an ip address to the NFS server. <path_to_test_mount> = This is the directory on the host that will be mounted to. First make sure you have nfs installed. Now edit /etc/exports you should add a line like this /<path_to_nfs_root>/ *(rw,no_root_squash,insecure). Now restart nfs. To update the root file system on the nand, you will need to have a running NFS server as described in the above section. You can get the latest root_fs from here grip_squeeze_20110512.tar.bz2 and un-tar it on your NFS server. If you would like to create your own UBIFS, go to this link. Now we need to have u-boot boot up to connect to your NFS server for the root file system. Just as the board is booting up, you will see Hit any key to stop autoboot: You will have three seconds to hit any key. When you hit any key, you will be placed into the u-boot command. Now save the new environment variables. You can now reboot your board and see if it connects to your NFS root file system. Note: On your NFS server, make sure you edit /etc/network/interfaces and comment out all the lines so that the kernal will not reset your network while booting up as the U-Boot has already setup the network for you. Now lets install the new root file system. Take your new .bz2 file that you either created or download and put it in the root of the NFS root path. The first command you will be doing, is going to format the root file system partition on the NAND drive. Note: We will be using mtd5 as this is the partition where the root file system resides and this will not erase the boot partition that contains U-Boot. Now we will be creating a new volume. Now lets mount the new partition. Now let un-tar the new root file system into the new partition. Now we will move the un-tared root file system into the root of the partition. Lets do some clean-up to gain some room as flash memory is limited. Reboot the board and use the above commands to restore bootargs in U-Boot to boot from the new root file system on the board. Remember to save your environments before rebooting again. You are now ready to use your fresh installed root file system. Now we can "attach" it. This is telling the kernel to use the ubi subsystem for that partition. The -m 1 says use /dev/mtd1. Ateml SAM-BA can be used to to flash the linuxstampII board. Some special considerations must be taken to properly communicate with the board. 2) There cannot be any executable code in flash. It must be erased or you can very carefully pull the CS pin (pin 9) high to temporarily disable the NAND flash upon powering up the board. 8) You can now write fresh versions of the at91bootstrap and u-boot! This page was last modified on 9 November 2011, at 21:58. This page has been accessed 47,004 times.